Beth at Simply Beth invites us to hone in on three simple words on Wednesday. I vacillated between two different sets of three-word-phrases but they intermingle so well especially at this point in my life. Just days ago I scribbled these three words in my notebook—WAIT ON GOD. As I walked that morning there was more dialogue about waiting on God, I didn’t understand this need of God to bang me upside the head with these words. Because it feels as if I have been waiting in a particular area for a looonngggg time. Right when I thought the script of my life was about to hit fast forward, He clicked it on pause and I have been hanging out in the wait zone for months that has turned into over a year now. Some days I take the waiting in stride but other days I find myself anxiety-riddled and frustrated in the throes of singing my favorite Davidic song of “how long oh Lord” all the while contemplate if I really heard God in the first place. ( I’m just being honest here….sometimes I ponder within myself did I miss God on this one.) Have you ever found yourself in that place? Wanting to give up but feeling that you just can’t. Although I know the definition of the word, I still took a moment to look up it’s definition. According to Merriam-Webster online dictionary, wait is a transitive verb which means to stay in place in expectation of. Another definition describes it as to remain inactive or in a state of repose, as until something expected happens. 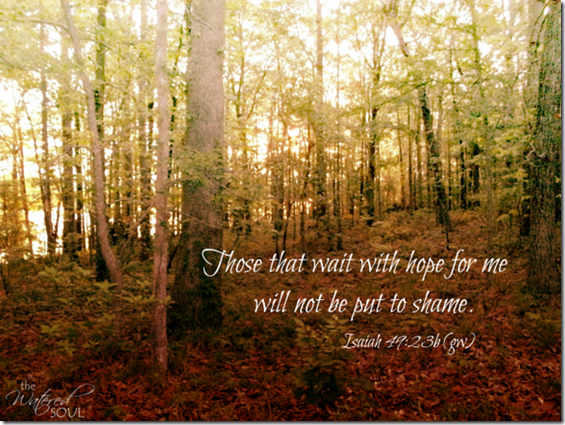 So what does waiting have to do with the three words: Trust in God, you ask? To stay in a state of inactivity and rest until something happens takes trust. So even when I can not foresee all the pieces coming together yet will I trust in God. Hi Wanda! I love your choice today. I am waiting for a couple of things to be resolved too, and I am not good at it. I’m sorry about what happened yesterday? Seems like we’re getting closer and BOOM, we’re further away. Like walking a labyrinth. But as you quoted, those who wait will be blessed, so I think we should look forward to some of that! I know I can’t give up, and that he wants me to rely on him alone. I’m not good at that either. So, I’ll remain after school to get some more instruction. You are in my prayers, my friend. Yes, life has a way of popping up the unexpected but I’m glad that nothing ever catches God by surprise. He still knows how to direct our paths. I appreciate your prayers Ceil. “Wanting to give up but feeling that you just can’t.” You are speaking something, Wanda. There are things I have been waiting on for so long, I have lost count of the time and the tears; YET, I KNOW that I cannot give up my expectation; I KNOW WITHOUT ANY DOUBT that giving up is not an option. Yes, that is faith, for I certainly do not see any sign of it; I just know it because I trust God. Indeed that is faith. If we see it, we have no need of faith. May we continue to be full of expectation of Him. Blessings to you friend. But, I think that I would disagree that a time of waiting is a time of inactivity. I say, do not be fooled. That “inactivity” is only on the outside, because God is always working. And, a time of waiting is when God seems to do His best *inside* work in me. Much character-building, faith-stretching, trust-growing, and heart-transforming happens when “nothing” is going on. Hang in there, Wanda. I have a feeling that this latest setback is but God’s re-direction, and that He will be closer to you than ever in the waiting. I agree Sharon, waiting doesn’t necessarily mean there is no activity taking place, although some activities are being postpone. Yes God has assured me that me that waiting is not just wasting time. Beautiful post. To continue to wait on God does indeed take trust. Praying He will continue to strength you in this waiting season. I appreciate your prayers Barbie. Dear Wanda, first..I’m so grateful God connected us in this blogging world. In this short time you have blessed me so much. Your words here today are beautiful. “Wanting to give up but feeling that you just can’t.” Oh yes…I’ve been there and am still there. I know He is doing something inside of me but I keep wanting to rush ahead to know just what it is. But I keep hearing..”wait.” But waiting can be so hard sometimes. I’m trusting Him though right with you. He will not disappoint. Love you my friend! Beth recently posted..Three Word Wednesday: He loves me. Beth, I’m happy to have connecting with you through blogland as well. Waiting has been a reoccuring theme for this year and it isn’t always the word that I welcome hearing but I do know that God produces much even in seasons where it looks like nothing is happening. I get this. I’m in a season of waiting on a couple situations/dreams. I have no idea what will come of them, but I do believe God is working in ways I can’t quite see. Hi Kristin! I do believe much is produce during our seasons of waiting. Oh BOY do I know this. The most frustrating thing is when you can see things happening that would enable the thing you asked for, but then nothing happens! LOL….I always love your honest replies Elizabeth and I actually thought of you when I finished writing this piece. I know the feeling of the hurry up please Lord! Waiting. Trusting. Obeying. Those three are so interconnected, Wanda. I feel you on waiting for what might seem like forever and having to say (in my best Joyce Meyer voice) “Why Lord, why? When Lord, when?” The comfort lies in the fact that He does hear us and is working on the answer. Alison Hector recently posted..I’m not here for the fear! Thanks Alison for sharing those resources. I will have to check out that book and really like that quote from Jesus Calling.